It might have only been less than a year later that I did meet Oprah and then have been on her show many times since. This “manifestation-of-Oprah” did not take less than a year, however. This manifestation took years and years. Years of preparation. It was a slow-cook process. I say this to remind us all that nothing comes into manifestation immediately. Everything we see and are, is a slow-cook process. It was only when I was able to harness my inner mental energies that I was able to harness my outer world to cooperate with my dreams. It took severe inner discipline to create this alignment. Of my lack of self-belief, worth and power. Of my lack of trust. Oh, and let me not forget to mention, my lack of consciousness around my UNconsciousness – my ego, in other words. It is only when our inner worlds are in true alignment with our outer vision – as in, a full match to what we desire on the outside – in every possible way – in terms of worth, courage and abundance – only then, will our visions manifest. Therefore, if you are in a place in your life where you are feeling stuck, don’t look outside for support. What is my inner reality right now? In what abode do my thoughts live? Are they bathed in fear or fearlessness? Entombed in scarcity or abundance? Riddled with judgment or compassion? This much I know to be true: what is within is without. If you want abundance in the outer realm you HAVE to be LIT UP WITH ABUNDANCE FROM WITHIN. full-on declarations of worth and inner power. I am grateful, I think this will elevate my awareness to the next level. Much love? I am so grateful I discovered you before becoming a mother and I feel so blessed to learn from you. Love you ? Just in time for Thanksgiving, a recipe for manifestation using a crockpot. In a microwave world, thank you, Dr. Shefali, for explaining that change is a slow process that takes discipline, consciousness and honesty from WITHIN to achieve your life’s desires. Peppered with vulnerability, your words are enlightening and I look forward to you spiritually lead us into the 21st century. Sorry, probably went too far with the food reference. I don’t even cook. Just reading your posts is to get a charge of positive energy! Thank you Shefali! Wonderful! Thank you so much for all you have done to raise the level of consciousness in all our lives! Thank´s for sharing….there´s so much to learn…i´am in “working process” to manifest 🙂 Namasté! 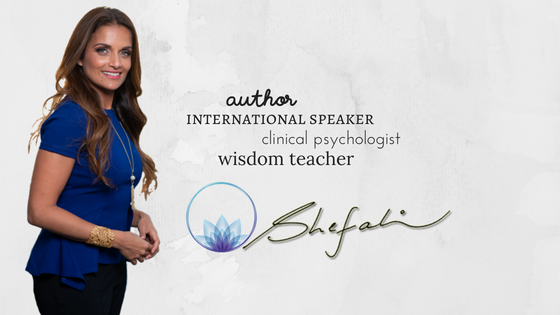 Thank you so much for sharing Dr. Shefali! This was exactly the information I needed to learn today in order to understand where I stand at this exact moment! Once more you have helped me see clearly. I’ve been reading your books, listening to your audio books, watching your interviews and through them I’ve become an improved version of myself and, most importantly, an improved mother to my lovely kids. Thank you! !